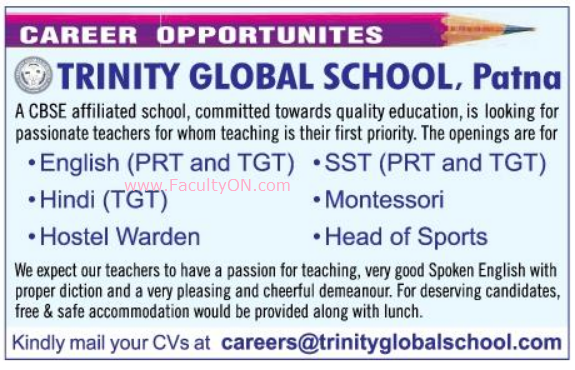 Trinity Global School, Patna has advertised in THE TELEGRAPH newspaper for the recruitment of Teachers- TGT / PRT jobs vacancies. Interested and eligible job aspirants are requested to apply immediately from 02nd October 2018. Check out further more details below. About School: A world-class school, Trinity Global, offers state-of-the-art infrastructure to facilitate all round learning. Besides emphasising on communicative English and number skills, we expose the students to a wide range of sporting, cultural, creative and extra-curricular activities. TGS has both day and boarding school in Patna. How to Apply: Interested and eligible candidates are requested to send their CV with supporting documents to the email address given below.